In his Press Released column this week, Sean Sands suggested that it was ok for kids' entertainment to be just that - entertainment - and have little to no educational value. While I don't claim to be an expert on raising children - my kids have four legs and fur, and once they learned not to poop on the carpet, their education was pretty much finished - I think he's right. The problem is that most educational games are about as subtle as a brick to the forehead when it comes to imparting information, and though most folks like learning, they tend not to enjoy straight-up schooling. If you really want your game to smarten up your audience, you need to wrap its educational core in a nice fluffy blanket of fun - or maybe just a bright red trenchcoat. We had a behemoth of a PC in our den when I was growing up. Ostensibly it was for me to use as a word processor for my school papers, but I think my dad really just wanted it because it was a nifty new gadget that went beep. It was huge, it was beige, and it used five-and-a quarter inch floppy disks to store your files. 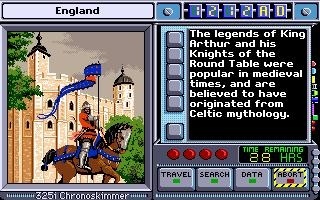 I thought it was cool, but I didn't really grasp its power until my mom gave me a copy of Where in Time is Carmen Sandiego. She figured if she had to have this hulking heap of technology in her house, the least it could do was teach her kid something. Where In Time was the latest in the series of games that featured a wily thief named Carmen Sandiego, who, with her bumbling team of criminal minions, stole artifacts from around the world. It was the player's job, as an agent of the Acme Detective Agency, to track the thieves, gather enough evidence to secure a warrant, and finally to arrest them and return the purloined loot. At first, I was reluctant to so much as open the box. I mean, really, how much fun could a game that was clearly trying to teach me history - my least favorite subject - really be? So I kept playing Monkey Island and Zork and the other games I had acquired for the computer. The real games. Eventually, my mother got tired of waiting for me to tackle Carmen of my own volition and directed the full force of her Guilt Beam at me. I sulkily put away the fun stuff and dutifully fired up what I was sure would be an exercise in slow, dull gaming torture. I mean, it came with a mini-encyclopedia, for pete's sake, it couldn't possibly be entertaining. Oh, but it was. I wasn't being asked to memorize names and dates, I was following cunning thieves around the world in a time machine. This wasn't history, it was detective work! I would arrive in a location mere moments, it seemed, after one of Carmen's light-fingered crew had left it. Determining the thief's new location required careful examination of the area for clues and potential witnesses. You could win the game though simple trial and error, following each possible avenue until you stumbled across the right one, but that was slow and clumsy. I was never going to catch Carmen Sandiego by stumbling around like a fool - she was far too crafty for that. So I questioned witnesses and I examined physical evidence, and I looked up information in my mini-encyclopedia. And I loved every single minute of it.